It’s almost a given that your childhood is probably haunted by the memory of a mother forcing or – best case scenario – begging you to “eat your beans”. Which makes us think mothers should have a reason for that. In fact, it is more than a reason or two; they have food science on their side. High in all three types of fibre (soluble, insoluble and resistant starch) and protein, a great source of vitamins B2, B6, B9 (folic acid) and minerals such as copper, iron, manganese, magnesium and zinc, legumes are heralded as a superfood by nutritional experts worldwide. Considering they are also budget-friendly, it comes as no surprise they are one of the main food categories in diets all over the world, including the Mediterranean. Plant proteins make them an undisputable substitute for meat dishes. For instance, chickpeas and lentils contain approximately 9 grams of protein per 100 grams, while in soybeans total content of protein can exceed 30 per cent. Protein absorption is increased when combined with grains, such as rice or dried nuts, while iron absorption is stimulated by vitamin C, for example, by sprinkling lemon on your legumes’ dish. Due to the low glycaemic index (GI) legumes have, our body breaks down the nutrients slowly, making us feel full for longer and keeping our blood sugar levels stable. In addition, this makes them a particularly good food for preventing and managing diabetes. They are also low in fat and sodium as well as being cholesterol free. What’s more, your heart loves legumes. Several studies show that they can help reduce high blood pressure and inflammation markers in the body. Regular consumption can also favourably affect the risk factors for metabolic syndrome, a key player in the development of cardiovascular disease. Their high fibre content can help you improve your digestive health. As a matter of fact, a cup of beans packs more fibre than broccoli. The antioxidant and anti-inflammatory effects offered by certain bioactive plant compounds provide a nutritional wallop to even help fight chronic diseases. Emerging research confirms that including legumes into your eating plan equips your organs with a ‘protective shield’ against the growth of some types of cancer cells responsible for causing stomach, kidney and bowel cancer. 1. Rinse the split peas with plenty of water. 2. Heat a large pot over medium-high heat; add 2-3 tablespoons olive oil, the chopped onions, garlic and some fresh thyme and sauté. 3. As soon as the onions start to caramelise, add peas and blend. 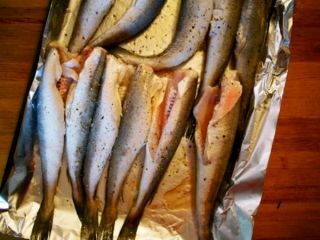 Pour in warm water and olive oil, turn heat down to medium and season well with salt and pepper. Simmer with the lid on for about 40-50 minutes, until the split peas are thick and mushy. While the split peas boil, some white foam will probably surface on the water. Remove the foam with a slotted spoon. 4. When done, pour in the lemon juice and transfer the mixture to a food processor. Mix until the peas become smooth and creamy, like a puree. 5. 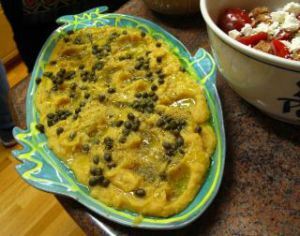 Serve the fava with a drizzle of olive oil, a tablespoon of diced onion and some capers or chopped parsley. 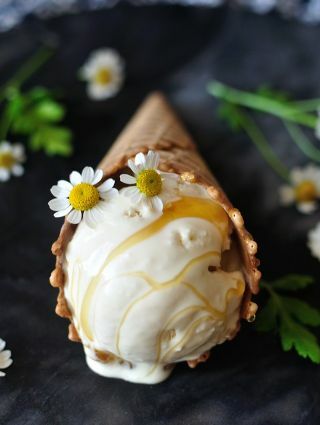 Our favourite soothing and calming remedy, chamomile (hamomili) can give a sophisticated touch to a frosty treat that is sure to please both kids and adults. Other than being the ideal infusion before a good night’s sleep, chamomile is widely used for its anti-inflammatory and antimicrobial activity, while some studies also claim that chamomile extracts have anticancer effects. 1. Combine milk and cream in a heavy-bottomed medium saucepan and bring to a boil over medium-high heat. Remove from heat and stir in chamomile. Cover mixture and let stand 10 minutes. Meanwhile, whisk together yolks, sugar, and salt in a large bowl until thoroughly combined. 2. Uncover milk mixture and bring to a bare simmer over medium-high heat. Remove from heat and gradually pour 1 cup milk mixture into yolk mixture, whisking constantly. Add remaining milk mixture all at once, whisking until just combined. Let stand until slightly thickened, about 10 minutes. Pour through a fine sieve into a bowl set in a larger bowl of ice water. Stir in honey and let stand, stirring occasionally, until cold, about 15 minutes. 3. Process mixture in an ice cream maker. Serve immediately or transfer to an airtight container and store in freezer up to 1 week. No Greek gathering is complete without the little plates of mezethes on the table complementing the traditional anise-flavoured liquor of ouzo or tsipouro or just a glass of wine. The word μεζέ (μεζέδες in plural) is of Turkish origin, borrowed from the Persian mazze, which means ‘taste’ and/or ‘snack’. Its history traces its roots back in antiquity in the Middle East and Eastern Mediterranean region. Ancient Greeks following their usual hospitality custom would never welcome guests without something to nibble along with the drink they offered. But truthfully, nearly every Middle Eastern or Mediterranean country, and the Balkans as well, at some point developed the culinary tradition of small dishes served as appetisers or finger food. The Byzantines and later the Persians are said to have greatly influenced and inspired Turkish culinary expertise, among others. Therefore, before and during the years of the Ottoman Empire, a great number of elements from different civilisations made Turkish cuisine a blend rich in both flavour and variety. The Turkish occupation left undeniable traces in the cuisine of Greece and among these a list of mouth-watering mezethes. Even though mezethes can be served to start off a meal, they should be seen as a separate eating experience rather than appetisers. In a Greek get-together it is common that a meal starts and ends with small savoury treats without any main dish served. People gather around the table and drink the good old – often homemade – tsipouro or ouzo complemented by mezethes, which are shared by everyone. But meze does not only stand as the perfect excuse for staying at home, but for having a fun night out as well. 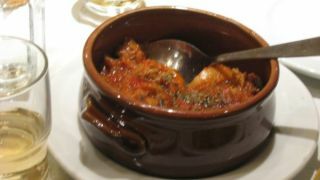 A whole category of restaurants called mezethopolia (μεζεδοπωλεία) is dedicated to serving exclusively meze dishes. In fact, the heart and soul of meze is said to be in Volos, a coastal city in central Greece. If you ever find yourself in a mezethopolio in Volos, have in mind that you are only allowed to choose your drink of preference. Each time you order another round, the chef sends out one or more different small savoury plates that best pair with the drink you’re having. The great thing about meze is that it can merely be a platter of olives, fried vegetables or some squid tubes; as simple as that. Alternatively, you can prepare a more ‘sophisticated’ one, choosing from the recipes below. Translated literally it means ‘drunkard’s appetiser’, so it doesn’t really matter if you don’t strictly follow the recipe, as long as you share bekri meze with friends over a glass of wine! 1. 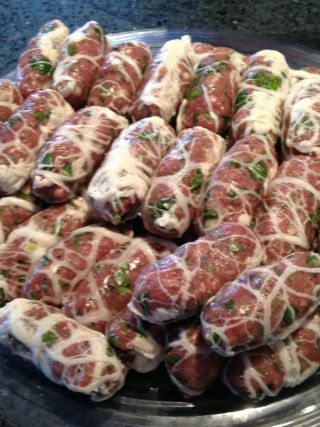 Wash the meat and cut it into large cubes. 2. Heat the butter and brown the onion. 3. Add the meat and all the spices and continue cooking. 4. Add the wine, and then the tomato paste, the tomatoes and the parsley. 5. Cover and simmer for about 1 1/2 hours. 6. If the sauce is too thin, add a little flour mixed with wine. Having its origins in Cretan cuisine, this mouth-watering feta version can be your new favourite appetiser. 1. To prepare the fried feta, start by cutting the feta cheese into little blocks, about 1.5cm thick. 2. Crack the eggs into a bowl and beat with a fork. Into another bowl add the flour, the paprika and the pepper and mix with a spoon to combine the ingredients. Into a third bowl, add the sesame seeds. 3. Roll each piece of feta into the eggs, then roll into the flour. Roll each piece again into the eggs and then in the sesame seeds, so that all sides are covered. 4. Heat about 6-7 tablespoons of olive oil into a frying pan, just enough to cover the bottom of the pan, and fry the feta until nicely coloured. Use a slotted spoon to flip the fried feta, so that it is nicely coloured on all sides. When done, place on some kitchen paper to absorb the extra oil. 5. In the meantime, warm the honey into a saucepan, or the microwave, until liquid. 6. Serve the fried feta while still hot with a drizzle of honey. You can either serve the mix in one bowl or strain the veggies and place them on a separate plate. Create a traditional Greek street-food experience in your own kitchen. Souvlaki is arguably the most popular street food in its country of origin, Greece, but it is much loved in Australia as well. The word ‘souvlaki’ means ‘meat-on-a-skewer’, but Greeks tend to refer to all pita wraps as ‘souvlakia’ whether they contain gyro, skewers or kebabs. Sometimes, however, it’s a bit tricky to find the original souvlaki recipe and to ensure the quality matches your expectations. Homemade souvlaki is the best way to take control of what you eat and make your family and friends happy. Souvlaki can be a very healthy dish for people on a diet and, of course, your children, if cooked properly. The first step for a delicious souvlaki is the tzatziki. For an easier version, you can substitute the tzatziki sauce with some fresh yogurt, but there’s nothing like the original recipe. Therefore, it’s better to put in the effort and go all the way. To prepare, pour the olive oil and garlic in a blender together, and blend until the garlic is dissolved. Into a large bowl, grate the cucumber, remove the juice, and season with salt and pepper. Set it aside for 10 minutes. Then add the blended garlic and oil, yoghurt, lemon juice and red wine vinegar, salt and pepper, and mix well. Store it covered in the fridge until you serve. All the tastiness lies in the way you season and marinate the meat, not to mention the method of roasting. Using good quality pork or lamb with as little fat as possible is essential for the gyros – preferably slices of tenderloin. Put some milk in a large pan with a honey and vinegar marinade, and season with a selection of Greek spices like oregano, thyme, rosemary garlic and onion. Wrap the pan and leave it in the fridge to rest, soften, and adopt the aromas of the spices for about two hours before you grill or roast it. Put a large non-stick pan on high, and when it’s really hot, add the meat pieces along with the prepared marinade, and sauté for 2-3 minutes until the meat turns a dark gold colour and looks crispy. Place the meat on a kitchen paper towel to absord excess oil, and leave it in a slightly warm oven. You will also need some parsley, sliced ripe tomatoes and red onions, as well as potato chips, as the original Greek recipe includes that, too. Make sure you get fresh puffy Greek pitas for your souvlakia and avoid deeply frying the bread in excessive amounts of oil. Opt for a healthier bake on a grill or even in a non-stick pan. You won’t need more than two minutes on high. Once your pitas are ready, grab a large piece of baking paper or foil and place the pita on top. Spread tzatziki and then add the meat, followed by the onion, tomato and chips. Garnish with some salt and paprika, sweet or spicy. Another secret to a mouth-watering and enjoyable souvlaki is ensuring everything stays in the pita. There is nothing worse for the definition of the flavours than stuffing large amounts of meat or potatoes in. 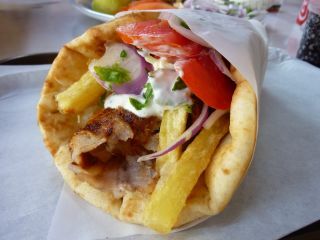 As impressive as an extra-large souvlaki may seem, struggling to get a full bite in your mouth steals some of its charm. Don’t knead the mixture, only fold. Put the butter in the end and keep all ingredients warm to make one of the tastiest Tsourekia. 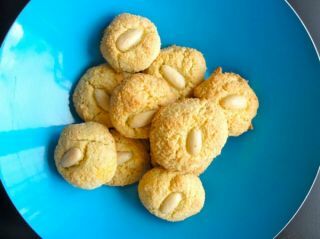 This is a fail-safe recipe; it has come to me via a friend from Thessaloniki that her mother taught her and has been in their family for generations, this is a large quantity, if you want a smaller quantity halve the recipe. 1. Everything has to be warm. 2. The butter goes in at the end. 3. We don’t knead, we only fold until everything becomes one. This is important, as too much kneading makes the gluten more glutinous and will make the tsoureki hard. 2. In a large bowl put the sugar, salt, the spices, the seed oil. 3. Add the warm milk and mix. 4. Beat the eggs slightly in a separate bowl and add them to the mixture. 5. Add the yeast and mix everything, preferably by hand. 6. Add the flour gradually, folding gently by hand until you have soft dough. 7. Melt the butter and add while warm but not hot and fold in gently until all the butter is one with the dough. 8. The dough should be warm; put it aside to rise, covered well. I usually cover with a blanket as previous women in my family have done. Leave for at least an hour or when the dough had doubled its size. 9. 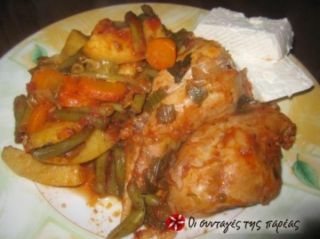 Make the tsourekia into any shape that you wish and you might like to add a red egg. 10. Put the tsourekia aside to rest for 30 minutes, brush with an egg yolk that has been slightly diluted in warm water. 11. Bake for 20-30 minutes on a medium heat of 170°C – the time depends on the size. Magiritsa can also be served as a vegetarian soup, with mushrooms and vegetables along with soy rice, fresh herbs and egg lemon sauce. 1. 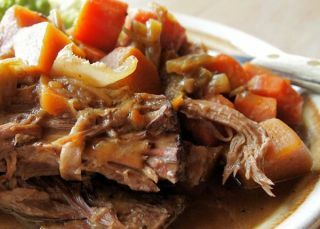 In a large saucepan place the lamb shanks and onions, put lots of water almost to the top, leaving enough so that water does not spill over. 2. Bring to the boil, turn heat down to a simmer and cook for one hour, regularly skimming the white residue (fat) left over by the cooking process. 3. Add the chicken wings and cook for another half hour continuing to skim the fat. 4. Take off the heat, strain the stock in another large saucepan, which you will to make the magiritsa in. 5. Put meat aside for now until cool enough to handle. 6. To the meat stock add the carrots, celery, parsley, and dill and cook on medium heat. 7. While the vegetables are cooking, take the cooled shanks and chicken wings and strip all the meat off, discarding all bones and skins and cutting into very small pieces. 8. Add the cleaned meat into the stock with the vegetables, add salt and pepper to taste and cook for another 20 minutes. 1. Beat the egg whites till they form peaks. 2. Add the egg yolks and beat till blended well. 3. Add the lemon juice gradually while beating. 4. While the soup is till simmering take small amounts of very hot soup and add to the egg mixture gradually while beating all the time, do this unitl the bowl is full. This heats the egg mixture slowly before pouring into the soup. 5. Add the egg mixture into the soup, stirring constantly while it’s simmering for at least 5-8 minutes until the avgolemono sauce becomes one with the soup. 6. Serve with a dash of freshly diced spring onions sprinkled on top. Note: If this done carefully the soup can be reheated the next day safely and without scrambling the eggs. Hot and delicious sea-food delicacies no-one can resist. A traditional Greek dish suitable for fastingNote: If the mixture is a little loose, add a small amount of bread crumbs. To make well shaped keftedes put a little oil on your hands. 1. Boil octopus in salted water that has the bay leaves and vinegar added for about 1 hour. 2. 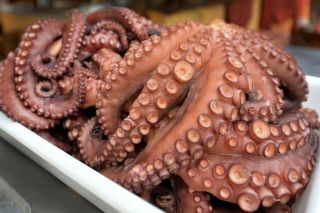 Remove octopus, cool so it can be handled and cut into fine pieces. 3. Sauté onion and garlic lightly in a little olive oil. 4. Add the octopus, stir and add the wine and allow to cool well. 5. Pour octopus mixture into a bowl and add the parsley and dill, salt and pepper. 6. Add bread and knead the mixture until well mixed. 7. Make into small balls of flat fritters, roll in flour before frying. 8. Fry in good olive oil. A healthy and colourful dish, that will make everyone ask for more. Politikes piperiesNote: If you have no black raisins and you opt for the blond one keep in mind that they are sweeter and will affect the taste of the finished dish. 1. Heat the oil and sauté the pine nuts. 2. Add the eggplant, zuccini, onion, and sauté till limp without burning. 3. Add the tomato and the tomato juice (keeping a little amount), the pligouri, sugar, garlic, salt and pepper (if needed add a little warm water). 4. Take the pan off the heat and add raisins, parsley and dill, mix well. 5. Open the lid of the peppers and take out the seeds, salt and pepper the insides. 6. Fill the peppers with the mixture, line up in an oven dish and cover the peppers with their lids and sprinkle with a little olive oil. 7. Add the leftover tomato juice and one cup of water. 8. Bake in 180°C preheated oven for one hour. Remember to include some lemons on the side. *All cephalopods (octopus/squids/calamari) are allowed during fasting, as they do not contain blood. 1. Put the saucepan to heat and add the octopus. Mix until the juices are pink-ish and cook it in its juices until that liquid has evaporated. 2. Remove the octopus and cut it into small pieces. 3. Add olive oil to the pot and sauté the onion until it’s translucent. Add the spice mixture, roasted garlic and mushrooms and sauté for a couple of minutes. 4. Add the octopus and then add the wine and stir for 2 -3 minutes until the alcohol evaporates. 5. Add the bay leaves and the lemon slices. Bring to a boil, lower heat and cook for about 15 minutes, until the onion becomes soft. Remove the bay leaves. 6. Add 1 cup of water and bring to a boil. Add the salt and pasta and lower heat. Cover and simmer for twenty minutes while stirring. 7. Serve with finely chopped parsley and cracked pepper on top. A great seafood wow dish for the dinner table. NOTE: if you have leftover stuffing add some orange zest and serve as a pilaf, it might need a little more cooking with a little more water. 1. Wash and clean calamari and remove the backbone. Dice up the tentacles to put aside and use in the stuffing. 2. Wash the rice and put aside together with the tentacles. 3. In a large, deep frypan heat the oil and sauté the onions until translucent. 4. Add the tentacles, rice, seasonings, sugar, currants, pine nuts and a small glass of water and cook on slow heat. 5. When the water has evaporated, remove pan from the burner and add parsley. 6. Stuff the calamari half way and thread the opening with a toothpick. 7. Line up the stuffed calamari in a saucepan and cover with the tomato and simmer for 20-25 minutes until tender. Halva is an easy to make, nistisimo sweet, ideal for those preparing for Christmas. It is a traditional Greek semolina cake that is initially toasted and then infused with cinnamon. The cake is finally moistened with a honey and sugar syrup mix. The result is an aromatic, grainy textured cake. 1. Place all the syrup ingredients in a pot and stir until the sugar is dissolved. Gently bring to the boil, reduce the heat and simmer for 5 minutes. 2. Whilst the syrup is simmering, place the sunflower oil and semolina in a heavy based pot. 3. Keep stirring to gently toast the semolina until it is a deep golden colour and add the ground cinnamon. Stir. Remove both pots from the stove. Gradually add the hot syrup into the toasted semolina mixture. Be careful as the semolina will start to bubble and may splatter. 4. When all the syrup has been added, take the pot back to the stove and stir until the mixture comes away from the side of the pot. 5. Cover with a clean tea towel and place the lid on top. Leave it to stand for 15 minutes. 6. Place the mixture into a mould or baking dish and spread evenly. 7. Sprinkle with a little extra cinnamon and cool. Gemista can be made with almost every vegetable, but most preferably tomatoes, peppers and zucchini. A vegetarian dish paired for the summer weather. A classic summer dish on every Greek table, if made without meat they taste even better the next day, can be eaten straight from the fridge on a hot day. I make the summer meatless version. The usual stuffed vegetables that one sees on a Greek table are tomatoes, peppers and zucchini; I have stuffed onions, eggplants and potatoes. 1. With the tomato upside down slice a small lid, with a teaspoon (easier if it has a long handle) scoop out all the inside and place in a bowl. 2. Inside of the hollow tomato add a sprinkling of sugar. Do this on to the tomato only, other vegetables that are stuffed do not need sugar. 3. With peppers discard stem and cut a lid. 4. Dig out all the seeds and discard. 5. Zucchini – make a lid on the fattest side and scoop out with tomato scoop, leaving it aside. 1. In a deep frypan, sauté the finely cut onion and spring onions. 2. Add the pine nuts and sauté a little more, taking care not to burn the onions and kernels. 3. Add rice and stir for about a minute. 4. Add raisins and mix. 5. Turn down flame to lowest point and add hot water. Cover and allow cooking till rice is half cooked. 6. Cool mixture enough to handle. Fill the vegetables with the filling. 7. Put lid back, line up in oven dish. 8. Sprinkle with about ½ cup of olive oil, cover loosely with foil. 9. Bake for ½ hour in hot oven at 190°C. 10. Remove foil and bake for another ½ hour. 12. Serve with feta on the table and crusty bread. The salty cheese counteracts the sweet watermelon. A refreshing salad for the summer table. I grew up eating watermelon and cheese or/and grapes and cheese. It’s a refreshing meal on a hot day. 1. Cut watermelon into small cubes and clean all grapes from branch. 2. Mix all fruit together in a bowl. 3. Spread the feta cheese on fruit and mix gently once or twice. Vlita are blites or notch wood. Use spinach, silverbeet or what is in season if you can’t find vlita. NOTE: Vlita are blites or notch wood. I’m not sure if they can be found in Australia, at least I have not come across them, but be creative – use spinach, silverbeet or what is in season, any green you might like. 1. Place cleaned vlita (or other greens) in boiling water, cook for a few minutes, do not overcook and drain well. 2. In a frypan sauté the onion till translucent. 3. Add the vlita, garlic, coriander and pepper and salt and stir well on high heat. 4. Lower heat and add the tuna, lemon jest and lemon juice, parsley and dill. 1. Place the sliced eggplants in a colander and salt well, allow to stand for 20 minutes, rinse well when ready to use. 2. In a saucepan heat the oil and sauté the beef cubes with cinnamon stick on high heat, stirring constantly. 3. Add beer and stir for a few seconds till the alcohol has evaporated. 4. Add the onion, garlic, tomato, sugar and add enough hot water to just cover the meat. 5. Cover and on low heat cook for 50 minutes, if needed add more water. 6. Preferably in a non-stick frypan: add 2 -3 tablespoons olive oil and sauté washed (patted dry) eggplants to faintly brown and put aside. 7. Add the rice to the meat (water must cover the rice) and cook for 15 minutes. 8. In the last 5 minutes add the eggplants, parsley, mint and salt and pepper to taste. 9. When the rice is cooked take off heat, cover with a clean tea towel and cover the towel with the lid as you would a pilaf and allow to stand for 15 minutes. 10. This is best served hot. * Caul fat is a thin edible membrane from the intestines of an animal. Once it is heated it melts but keeps the sausage in shape. You will need to order this from your butcher, as it is not readily available. It can be frozen up to 3 months. It should come washed, but you may still soak it in equal amounts of water and vinegar for about an hour before you use it. This will get rid of any residual smells of blood. 1. Combine mince, onions, parsley and seasoning in a large bowl. Use hands to mix well. 2. Cut a piece of caul fat (approx. 10 cm x 8 cm) and lay it on a clean surface. Take some mixture (approx. 1 1/2 times the size of your thumb), roll into an oval shape and place it on a corner of the caul. Roll and tuck with your fingers till it is covered twice over. Put it aside and repeat till all the mixture is used. 2. Prepare your grill or charcoal BBQ and place sheftalies on the grill. It will take approximately 10-15 minutes to cook depending how big they are. Do not turn too often as the caul will break and mixture will spill. 3. Once cooked, serve with pitta bread, tzatziki, more onion and parsley and enjoy with a cold beer. Kleftiko needs about 1kg of lamb. Your butcher will need to cut up the lamb into chunky pieces making sure each piece has bone, meat and some fat on it. 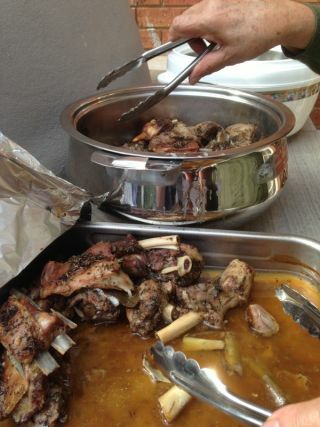 Allow approximately 1 kg of lamb per 4 people. Your butcher will need to cut up the lamb into chunky pieces (approximately each piece the size of your fist), making sure each piece has bone, meat and some fat on it. Your wood-fire oven temperature should be around 450-500 degrees. Once you have reached this temperature, push all the coal to the side of your oven. Make sure the flame has died down. 1. I am quite generous with my herbs as I like a lot of flavour. Marinate your meat from the night before if time permits. 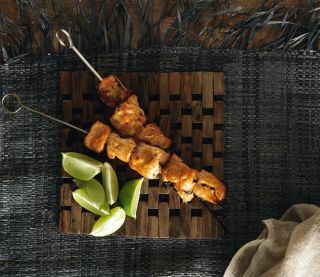 Put your marinated meat in a tray that can tolerate high, intense heat for the wood-fire oven and cover well with foil. Do not add any oil – a handful of water only. The fat on the meat will melt and will keep your meat moist. 2. After 2 hours prepare your potatoes as listed below and put them in the wood-fired oven. Leave the meat covered for the entire time and the meat will brown slightly. If you want your meat browned take the foil off after 3-3 1/2 hours and allow it to brown. Remember however, every time you open the oven you will lose valuable heat. to cook, for approximately 2 hrs. Discard burnt onion once cooked. As you use your wood fire oven more frequently, you will become more familiar with the temperatures and the length of time for food to cook. The size of your tray, the amount of meat in the tray, the intensity of your heat, how often you open the door to check on the food will all be deciding factors on how fast or slowly your food cooks. Each time you cook different volumes of food, it will make a difference in the cooking time. The trick is to allow time – it is a slow process, but well worth it. A Greek-style dip of mashed and whipped potato spiked with garlic. 1. Wash the potatoes thoroughly, leaving their skins on. 2. Fill a pot with water, add your potatoes and bring to a boil. Add a teaspoon of salt and cook until tender. 3. Drain and peel the potatoes when they are cool enough to handle. 4. Push the potatoes through a potato ricer into a large bowl. 5. Add the garlic, salt, pepper and vinegar. 6. While mixing thoroughly, gradually add the lemon juice and olive oil one after the other until your skordalia is nice and thick. Have a taste of the dip. If necessary, add more salt, lemon juice, vinegar or even garlic. 1. Wash the purslane, spin dry, and trim away any tough stems. Transfer to a salad bowl. Wring the liquid out of the shredded cucumber by gathering it up with your hands, one small bunch at a time, and squeezing it between your palms. Transfer to the bowl and add the herbs. 2. Whisk together the yoghurt, olive oil, garlic, and coriander and season with salt. Add the yoghurt mixture to the vegetables and mix well. 3. Season with pepper and additional salt if needed. Serve. 2. Then we cut the octopus into small pieces and put back in the pot with red and sweet pepper tomato paste and oil. Baked in the oven, this whiting dish allows the peppers to create a delicate sauce. Ingredients: 1 kg small whiting 1 onion, sliced into fine rings 1 green pepper 1 red pepper 1 orange pepper 1 yellow pepper 2 cloves garlic 4 tbsp tomatoes cut into cubes without juice or seeds 3 tbsp parsley chopped 60 ml olive oil Salt and pepper to taste Method: 1. Cut the peppers in half and remove the seeds. 2. Place the peppers under the grill with the skin side up for approx. 15 minutes. 3. You can now remove the skin easily and discard it. 4. Remove the head, tail and central bone from the whiting, keeping just the fillet but making sure that the fish are whole and not split. 5. Salt the fish and place in the fridge while you prepare the sauce. 6. Slice the peppers. 7. Place the oil in a frying pan and gently fry the onion rings for two minutes. 8. Add the peppers and garlic and fry for another three minutes. 9. Add the tomato cubes and parsley, stir in and fry for another two minutes, adding salt and pepper. 10. Place half of the sauce you have now prepared in a shallow oven dish. 11. Arrange the fish on top of the sauce and then spread the remaining sauce on top. 12. Place in a pre heated oven at 180°C for 30 minutes, so that the fish is cooked and the sauce set. Note: I’m not sure if we have neratzi in Australia, but they are a bitter/sour orange. If you can find them, use them. If not use lemons – you can also be daring and use grapefuit. 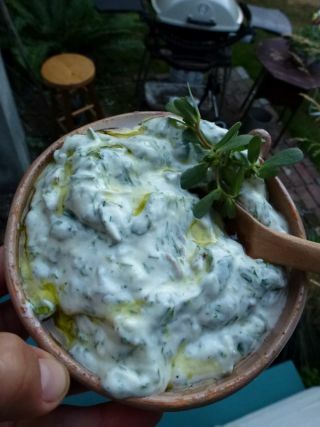 In Greece fennel comes like dill in bunches and the original recipe used this. I have adapted the fennel as we know it in Australia. I know it works well because at home I have adapted other recipes this way. 2. Slice fennel and clean and chop the green leaves fine as you would dill, keep the green part aside. 3. Lay out the fennel root in an oval oven dish. 4. Lay the mullet on top and cover with the orange and the neratzi/lemon. 5. Sprinkle with the finely cut green part of the fennel and add salt and pepper. 6. Pour the olive oil on top. 7. Bake for about 25 minutes. 8. Garnish with sliced lemon and serve hot. Place the turkey breast skin side up in a baking dish. Lift the skin and season with the sea salt, olive oil, herbs and roasted almonds. Drizzle olive oil over the top and cover with foil, leaving the edges slightly open to allow steam to escape. For every 1 kg of turkey weight cook for 60 minutes. When cooking time has elapsed remove foil and allow turkey to brown evenly. Remove the turkey from the oven and rest 30 minutes before carving. Carve the turkey with an electric knife. Roasting almonds: place the almonds in a small saucepan and cover them with filtered water. Bring the water to a boil, reduce heat and cook for 10 minutes. Strain the water from the saucepan and allow them to cool. Remove the skin and place the almonds on a non-stick baking tray. Place the tray under the grill. Keep watch, when the almonds become golden brown, turn them over to the other side. Once both sides have roasted, remove them from the oven and allow them to cool before mixing them with the herbs. 1. 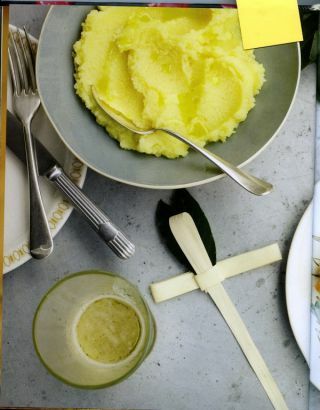 In a saucepan on high heat add 3 tablespoons of the butter. 2. Roll the rabbit in salt and pepper and sauté in the butter, turning on all sides. 4. Add the remaining butter to the saucepan and sauté the onion. 5. Add the flour and stir till brown. 6. Put the rabbit back in the saucepan, add the garlic and stir for one minute. 7. Add the wine and enough water to cover the rabbit. 8. Add the bay leaves and the salt and pepper, put the lid on the saucepan and on a low heat simmer for about 1 hour. 9. Beat the eggs, add the cheese to the eggs and add a ladle of the rabbit juice into the egg mixture, stirring quickly. 10. Add the egg/cheese mixture to the rabbit, stir lightly and allow it to cook for 1 minute. You can use any hard cheese for this dish, but many stick to kefalotiri. Use your avgolemono recipe for this winter soup. 1. Place the meat, onions and water into a large saucepan, add a little salt and bring to the boil. 2. Once it starts boiling, lower the heat to simmer and allow to cook for 1 hour, removing the foam from the top every now and then. 3. Add the potatoes, celery, bay leaf and simmer for another hour. 4. Take the meat out of the soup, remove and discard the bones. Cut the meat into cubes and put it back in the soup. 5. In a bowl prepare avgolemono by beating the eggs with the lemon juice together with a whisk. 6. Slowly add some of the hot soup liquid to the egg mixture and beat in. 7. Add the egg mixture to the soup and mix well. Turn the heat off. 1. Μουσκεύουμε τα ξυλάκια σε νερό μία ώρα πριν τα χρησιμοποιήσουμε. 2. Προθερμαίνουμε τον φούρνο στους 200°C. 2. 3. Κόβουμε τον σολομό σε μεγάλους κύβους και τον βάζουμε σε μπολ. 4. Προσθέτουμε όλα τα υπόλοιπα συστατικά και ανακατεύουμε καλά. 5. Μαρινάρουμε το ψάρι για 15 λεπτά. 6. Περνάμε τον σολομό στα ξυλάκια και τον βάζουμε σε ένα ταψί στο οποίο έχουμε στρώσει λαδόκολλα. 7. Τον περιχύνουμε με όση μαρινάδα έχει περισσέψει και τον ψήνουμε για 8 λεπτά. 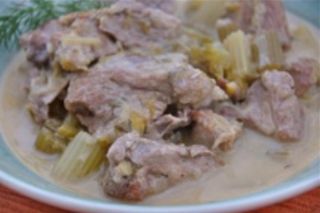 ΝΟΤΕ: It’s common to bake the lamb on a bed of vegetables in this region as it is in Macedonia. This recipe is from Thebes. 1. In a large bowl, place 6 tablespoons olive oil, 1/2 cup lemon juice, water, salt and pepper and beat well. Lay the meat in this mixture, cover and allow to marinate in the fridge for at least 1 hour. 2. Heat oven to 200°C. 3. Grease a large baking pan, clean and cut spring onions and garlic, keeping most of the green part. 4. In a large, deep frypan heat 1/4 cup olive oil and add the spinach till it wilts, remove from heat. 5. Add the cleaned and cut onions and garlic to the spinach. 6. Add the dill and parsley and remaining lemon juice. 7. Spread this vegetable mix in the bottom of the oven dish. 8. Place the meat on top of the vegetables and pour over the marinade juice and season with salt and pepper. 9. Bake for 35-40 minutes till meat has browned. 10. Turn heat down to 175°C. 11. Cover the pan with aluminium foil and bake for another 45-50 minutes. 12. Check and make sure that the vegetables have not dried out; you might need to add some water to the pan if this is happening. 12. Serve with the vegetables in a platter. You could use lamb chops and leave them whole instead of cutting them into chunks. *Note: This is so simple. 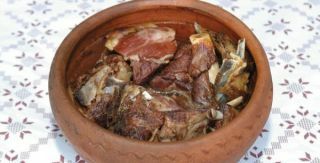 It’s a very typical Cypriot all-in-one meal called tava – you just need the time to prepare the lamb and vegetables, then you can fling it in the oven, go out for a (Greek) coffee and come home to a ready meal. You could use lamb chops and leave them whole instead of cutting them into chunks, which makes it even simpler. And it doesn’t need much by way of accompaniments – perhaps a salad or some simply sautéed green vegetables. Serves 6. 1. Preheat your oven to 180°C (350°F/Gas 4). 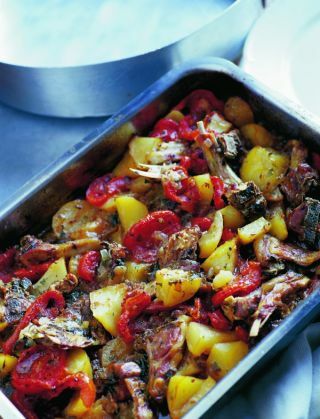 Put the onion, potatoes and lamb in a 5 litre casserole dish or a deep baking dish. 2. Season with salt and pepper. Add the parsley, cumin seeds and olive oil and mix through very well with your hands. 3. Put the tomato slices on top in a single layer and season lightly with salt. Dot the butter over the top and pour about 125 ml of water around the sides of the dish. 4. Cover with foil and bake for 2 hours, tilting the dish from side to side a couple of times and spooning some of the pan juices over the top. The lamb should be very tender and the potatoes soft. 6. Remove the foil, increase the oven temperature to 200°C (400°F/Gas 6) and cook for another 45 minutes or so, turning the lamb halfway through, or until the meat and potatoes are a little browned and the liquid has reduced. 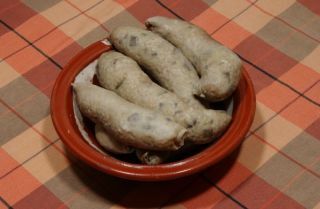 A traditional dish from the region of Pillion. 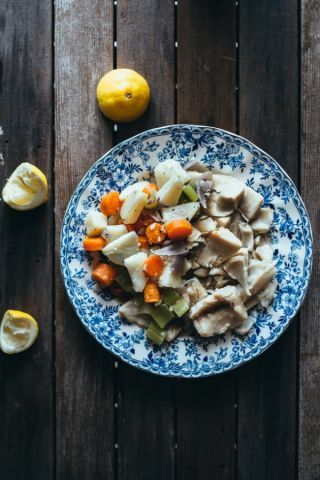 Note: This easy to make dish with a strange name is considered to be traditional in Makrinitsa and other villages of the very beautiful Pillion. 6. 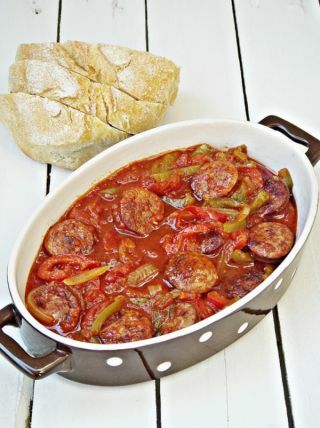 Put sausages into sauce, cover and cook for another 10 minutes. *Note: This is a classic dish of Volos and it is thought that it came here with the refugees from Asia Minor early in the 20th century. Other versions can be found in other northern areas of Greece. 1. In a large, preferably heavy frying pan, heat 3 tablespoons of olive oil and sauté the onions for a few minutes till translucent. Make sure they don’t brown, as the dish will then become very heavy. 2. Add the mince and sauté all together. 3. Add the tomatoes, all the spices, salt and pepper, cover and allow to cook for about 20 minutes on slow heat, adding 1 1/2 cups of water. 4. Remove the spices and allow mixture to cool. 5. In another frying pan, preferably non-stick, add 2-3 tablespoons of olive oil, roll the eggplant slices in the flour and fry on a medium heat on each side for about 1-2 minutes. 6. Heat oven to 175°C. You will need a wide, large oven. 7. On each eggplant slice place a teaspoonful of the mince mixture and roll the eggplant. 8. Continue to do this, lining up the eggplant rolls with the seam down and next to one another like soldiers. 9. You might need a toothpick to hold together the roll but that is optional. 10. 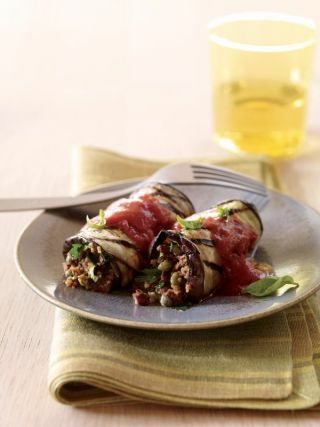 Mix the milk with the grated cheese and pour on top of each eggplant roll with a spoon. 11. Bake for about 25 minutes until the cheese melts and the rolls are golden brown. Make sure you wash the pork intestines thoroughly. 1. Wash the intestine thoroughly inside and out. 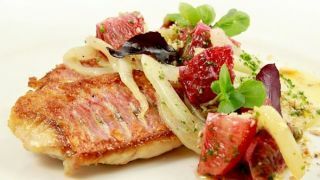 Pour half a cup of olive oil into a deep pan and sauté the onions and herbs, which have been washed and chopped finely. 2. When they soften slightly add 1 cup water, half a tablespoon of salt and a pinch of pepper. 3. When the mixture comes to the boil, add the rice and stir. Allow a few minutes for the rice to absorb the water and then remove from heat. 4. Stuff the intestines with the mixture, making sure to allow enough room for the rice to expand. 5. Tie a knot at the two ends of the intestines and place in the pot, adding the rest of the oil and water. Salt lightly and cook for around 40 minutes. 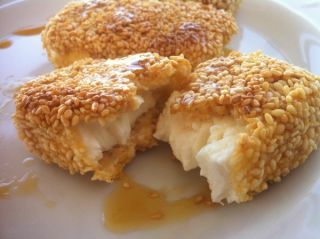 Naxos’ most iconic celebration dish. 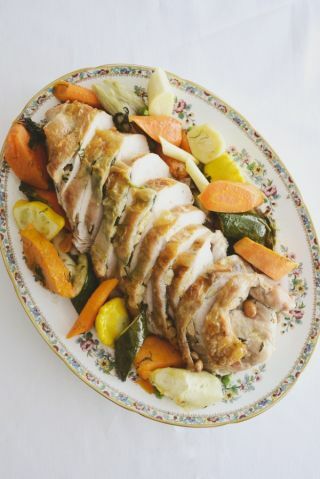 Christina Kannelopoulou and her son Giorgos run the Mythodia restaurant, near the town hall, where the cook showed us her version of rosto, the island’s most iconic celebration dish. The recipe serves 4-5. 1. Score the meat and rub with salt and pepper, stuffing the cuts with garlic and oregano. Drizzle with olive oil. 2. Heat the rest of the olive oil in a large saucepan and evenly brown the meat over a high heat. Add the wine and wait for 2 minutes until the alcohol has evaporated. 3. Add the grated tomato, tomato paste and as much hot water as needed to just cover the meat. When it comes to the boil turn the heat down to medium, cover the pot and cook for 45 minutes. 4. Then add the allspice, bay leaves, cinnamon, cloves and thyme, cover the pot and cook for another 45 minutes until the meat is tender. 5. Remove from the heat, put the meat on a board, remove the string and carefully cut into one-inch slices. Place slices back in the sauce and cook for an additional 10 minutes. 6. Meanwhile, cook the pasta for 3 minutes less than recommended on the packet and finish off in the sauce. Remove the spices before serving. An aged grated cheese, preferably a Naxos variety, goes well on top. If using fresh artichokes, cook them first. Artichokes have a bit of preparation to them, so make sure you give them the right attention. Note: Fresh artichokes need the branch cut off, the outer layer leaves discarded, then the top of the artichoke cut off as the top of the leaves are tough. Inside the heart there is a furry part (the choke) that needs to be scooped out. They are then placed in a deep bowl of water with salt and/or lemon juice and allowed to stand till ready to use. If left out of water they will discolour. They also need longer cooking time than the broad beans. I prefer to use artichoke hearts already in a can, it is easier and you can never go wrong this way. If using fresh artichokes, cook them first. Otherwise, cook the broad beans and then add the tinned artichoke hearts that have been drained. 1. In a heavy bottom saucepan, place olive oil and heat. Chop onion and spring onions finely and cook while stirring until translucent. 2. Put in broad beans, cover with 2 cups of water, cook until tender. 3. Add canned artichoke hearts, finely chopped dill and parsley. 4. Add lemon juice and cook for 3/4 hour or until vegetables are just right and not too overcooked, always on very low heat. 5. Make the avgolemono and pour on top, serve hot to warm. 1. Separate eggs, putting whites in a bowl and setting aside the yolks. 2. Beat egg whites till stiff. 3. Add yolks and mix well. 4. Add the lemon juice very slowly while beating the eggs so as not to curdle. 5. Add the hot juice from the artichokes and mix well. 6. Add slowly some of the hot juice from the vegetables into the warm egg lemon sauce and mix. 7. Pour the sauce over the vegetables. Other ingredients can be added to taste, like peppers or spinach. This is what the Italians call a frittata and we call it strapatsada. There are many versions from all over Greece and depending on the area its name can change too. I’ll give you a family size one, which can be made for the whole family with a salad and crusty bread on the side and is yummy. 1. Beat the eggs in a bowl with parsley and salt and pepper. 2. In a deep, ovenproof frypan heat oil and sauté onions till translucent. 3. Add the tomatoes and the olives and sauté for another 2 minutes. 4. Lower heat and add the eggs and cook till slightly set. 5. Add the feta and place under the grill till eggs rise and brown. Note: Other ingredients can be added to taste, like peppers or spinach. My favourite addition is freshly fried potatoes. Instead of grilling, the dish can be put in a hot oven for a few minutes. Also try fresh potato chips with fresh tomatoes and eggs – in this version you might like to leave the eggs ‘matia’ (to my non-Greek readers, the word means ‘eyes’ and we use it for eggs that are ‘sunny side up’). Feel free to change what cheese you use to your tastes. A pita without a pastry cover. This is a pita without a pastry cover. I have substituted the local cheese from Limnos with kefalograviera – maybe you would like another cheese. 2. In a large bowl mix zucchini, eggs, onions, the herbs and spices, the cheeses and pepper and salt. 4. Grease a pita dish and spread the mixture evenly. 5. Drizzle with a good olive oil on top. 7. About half way through the baking, cover with foil. 8. Take out of the oven, cut and serve hot or cold. Dora Kitinas-Gogos’ favourite recipe for the famous Greek cake. 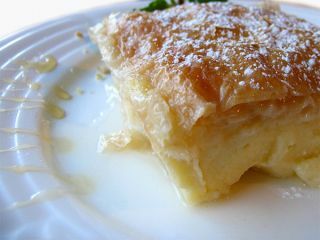 I have tried many recipes for a good galaktoboureko, this is the best one – once you use this recipe you will never use another. Put all these ingredients in a saucepan and bring to a gentle boil for about 15 minutes, put aside and cool. It is important that the syrup is cold when adding to the hot baked galaktoboureko. 2. Put 1 litre of milk in a saucepan with sugar and scald, take off flame. 3. Combine the rice flour and the remaining 300 grams of cold milk and blend with a spoon till all the rice and milk has become one and thick, making sure there are no remaining lumps. 4. On a very low heat add the rice flour mixture slowly to the hot milk, stirring vigorously so as not to lump. 5. When smooth and thick remove from heat, put aside and cover with a clean tea towel to prevent a film forming on top. 6. In a separate bowl, put in egg yolks and whole eggs and beat till all are one. 7. Add the zest to the milk mixture. 8. Add the egg mixture slowly to the milk mixture stirring all the time so eggs don’t have time to cook. 8. Cover with tea towel again. 1. Grease a 23cm x 23cm and 7cm deep square pan. 2. Lay one sheet of filo and brush with butter. 3. Do this with eight sheets of filo, tucking each filo into the corners of the pan. 4. Pour cream mixture on top of these layers of filo. 5. Do the same with the top layers. Lay eight sheets of filo, brushing each one with butter. 6. Trim the edges of the filo and tuck the remaining inwards. 7. Cut the top layers in diamond shapes, into serving size. 9. Bake for 45 minutes; remove from oven. 10.Pour cooled syrup on top, a cup at a time, giving each cup time to be absorbed. 11. Allow the galaktoboureko to cool for 3-4 hours before serving. Note: Never cover a galoktoboureko and never refrigerate as it goes soggy. These biscuits keep well in an airtight container. The recipe makes about 80-100 biscuits but you can halve the ingredients if you so wish. Bear in mind that these little morsels are seriously addictive. 1. Mix the almond meal, sugar, zest of lemon and rosewater. 2. Beat the eggs into a meringue (Note: frozen egg whites from the supermarket will not beat into a meringue consistency). 3. Add the meringue slowly to the almond meal mixture, mix to make a dough consistency. If the meringue is too much – don’t add it all, as the dough has to be tight. 4. Leave in the refrigerator to rest for about half an hour. 5. Make into biscuits of any shape – the traditional Greek shape is a small oval, 4-5 centimetres in diameter and 2 centimetres deep. 6. Bake on a very lightly greased biscuit tray, on 170° for 20 minutes. 7. Take out of tray, cool, and sprinkle with icing sugar while still warm.